So cute and helpless when they are first born, all kittens begin their lives with their eyes closed. Their eyes will usually start to open between 7-10 days and will be completely opened when the kitten reaches 9-14 days old. All kittens are born with blue eyes, and they will remain so for about 3 weeks. At that point the iris will mature, and the color will change to what it is going to be for the rest of their life. A kitten’s vision is blurry at first, because the retina is not fully developed. At about 10 weeks, they can finally see as well as an adult cat. Until then, they should be kept away from bright lights, because their pupils aren’t yet able to dilate and contract quickly. 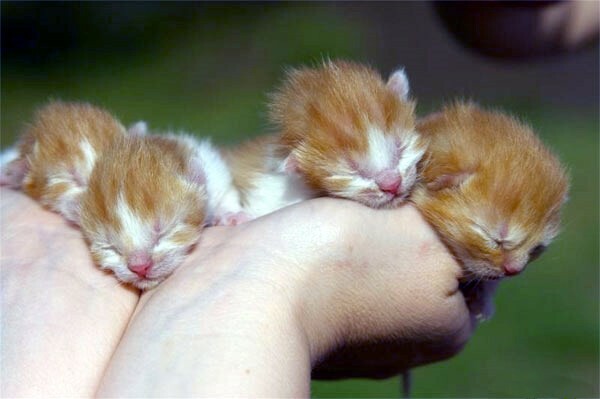 Tiny and fluffy newborn kitties with their little eyes closed? i think they a two weeks old when their eyes start to open. I think it varies, but that’s kind of the average.